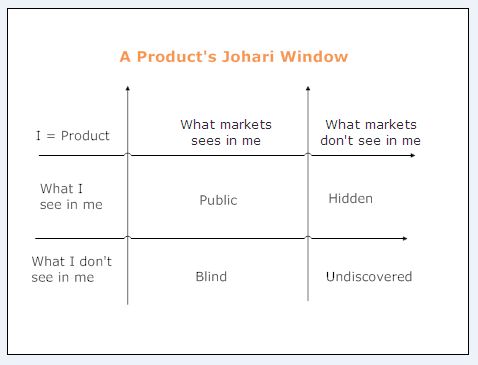 Reading a wonderful piece on Johari Window at psychcentral made me think about its application to a s/w product. With full respect to the author I do believe that the self of typical software beta can be compared with a human being’s self. Public: A common set of features that are visible to both my market and myself. e.g. – I am a project-management system. Everyone knows that I offer excellent flexibility in a collaborative environment and assist teams in priority assignment of tasks. Hidden: Set of features which only I know but my market i.e. my target audience/prospective customers do not know. e.g. – While I know that I can be integrated as a plugin to many IDEs not many in my market are aware of that. Blind: Things which are known to my market but I am myself unaware of them. e.g. – Cross-functional teams find me very easy to use. I am unaware of it because I belong to the other side of the coin. My market helps me discover these features. Undiscovered: It is the zeal to achieve this. Set of attributes, properties, features which neither me or my market not. Hidden/unknown to everyone. Social Media trumps Mass Media? Have you seen Pepsi‘s newest ad which is a spoof on Akshay Kumar‘s coke advertisement? Yeah the same ad which picks up from Akshay Kumar left us in the Thumbs up commercial. Pepsi has certainly marked the rise of a new dawn with its ‘Youngistan Campaign’ by releasing the advertisement on YouTube before it actually hit the mass media. The ad was prepared before IPL and was ready for launch on the mass media platform. As IPL still had sometime, thats when the Pepsi decided to zero in on YouTube. The concept behind Youngistan, the war b/w old and new was one of the reasons for selecting a new format. Youngistan is all about cool and young people and in India a heavy bunch of netizens are youngsters. It has hit the target audience in no time and ad posting didn’t cost a penny. The release has had a big time viral effect and is being reciprocated across multiple places. Its a first for the Indian companies and definitely an example for others to follow. It would be too early to lookat the comparison statistics between the two different forms of media. However, if you’ve a product with internet penetration here’s one option for you to consider. Web-based productivity tools have been around for quite a while, but their usage and focus has primarily been limited to a very niche audience. While scanning through the feeds in my ‘RSS Feed Reader’, I discovered an interesting update in Google Spreadsheets. On digging deeper, it appears that the update has solved a big problem for market-researchers and statisticians. Let’s look at the 2 ‘W’s then. What is the problem and what is the solution being offered by Google Spreadsheets’ latest update. No signing-up involved, as all you’ve to do is click on the ‘Google Docs’ link on top of your gmail link. The process of ‘Conducting Survey’ and ‘Collecting Data’ are merged together. The surveyor simply sends the questionnaire, to his target audience and all the answers appear in an excel sheet. Once you’re through with that you can use the traditional sorting and other functions to do deeper analysis. A fantastic utility and must add to any marketer’s kitty. 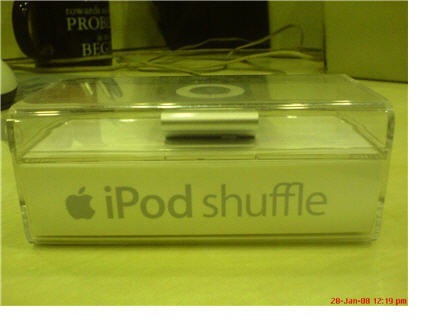 I recently bought an iPod shuffle (in the pic) for my Pune based friend. Apart from the quality of music and the usual set of features I am quite impressed with the manner of packaging. The transparent-rectangular box is quite compact and it allows you to see and actually feel the iPod from your eyes. I showed it to a couple of my close-mates who happen to be proud owners of different models of iPods. Now, amazingly their first comment about the box-wrapped gizmo was the change in its ‘packaging’. Both of them expressed their unhappiness with the packaging of their iPods. Understandably they had bought it several months back, but then again it throws a couple of questions in your mind. Is Apple also emphasizing on the packaging quality during the product life-cycle? Perhaps, because of this packaging you aren’t allowed to open it and try some music on the iPod. Is your buying behavior affected by the quality of packaging? Can you re-collect some instances in the past, where you’ve actually chosen a product/have been impressed by a product only because of its packaging? As a customer do you think smart packaging adds on to the value proposition of the entire product offering? Don’t miss-out Rajesh’s two cents here and here. He has quite beautifully highlighted the philosophy and the approach of product packaging in the context of Indian consumer durables. He has also quoted Parachute’s example which is perhaps the best demo. of what packaging innovation can do for a product. Strange heading for a blog-post, but I must admit that I couldn’t find a more appropriate one 🙂 Amul has announced the launch of its 24/7 ATM. Nope, it is not Automated Teller Machine aka Any Time Money it is Any Time Milk. Consumers have strong reasons to be excited as there is every chance of milk dispensing machines being seen across the entire nation. The machines can be operated 24/7, a customer-focused USP which is bound to attract a lot of buzz and attention. Having said that, it remains to be seen where & how much would the milk sales be during the 10pm-6am slot. Although, the market space is not purely un-contested the only competitor/similar service seems to be Mother Dairy which isn’t 24/7 and is functional in Delhi & NCR. The whole concept isn’t born from scratch but again adds value to the original idea..
A big word of thanks to trak.in’s post which instigated me to write this piece rather than dropping a comment in the original post.